The low cost Dwyer Series 673 Pressure Transmitter is a fixed range transmitter designed for harsh environments and suitable for high shock and vibration applications. 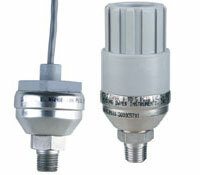 Constructed of stainless steel, the Series 673 provides a 4 to 20 mA output signal with 0.25% accuracy. Use the Series 673 in industrial OEM equipment, hydraulic systems, HVAC equipment, industrial engines and compressor control. Service: Non-combustible liquid, gas, or vapor. Wetted Materials: 17-4 PH Stainless Steel. Accuracy: RSS* (at constant temperature) ±0.25%. Non-linearity (BSFL) ±0.22% FS; Hysteresis 0.10% FS; Non-repeatability 0.05% FS. Temperature Limits: -40 to 185°F (-40 to 85°C). Compensated Temperature Range: -40 to 176°F (-40 to 80°C). Pressure Limits: 2X full scale range. Thermal Effects: Zero Shift: ±2.0% FS/100°F (±1.8% FS/50°C); Span Shift: ±1.5% FS/100°F (±1.3% FS/50°C); Warm-up Shift: ±0.1% FS total. Stability: 0.5% FS/year.Response Time:5 ms.
Power Requirements: 9-30 VDC.Output:4-20 mA**, 2-wire.Zero and Span Adjustment:Fixed. Loop Resistance: 0 to 800 Ω.Shock:200 g.Vibration:20 g.
Electrical Connections: 2 ft (61 cm) multiconductor cable. Conduit Models: 1/4"-18 (22.3 mm) knockout. Enclosure: Stainless Steel and Valox.